Many of you have been asking about trimming/cutting your pom’s coat for the summer. I have read lots of controversy on the internet regarding this subject, however, I can only talk about my own personal experience. 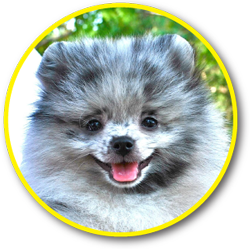 We have had pomeranians for nearly 25 years now and for a good portion of that time, our poms were always cut short into a puppy cut for most of the summer….never shaved, but a nice rounded short cut all over. My pups have always run outside, rolled in the grass, jumped in the weeds, waded in their little pools, etc., so for me, the short coat was easier to groom, collected less stickers and made them easier to remove, and made washing and drying time a lot shorter. It always worked great and by the time Fall/Winter came around they were back in their nice, long pretty coats. I have never had any issues with the coat not coming in as full….in fact, most of the time it was even fuller as it came back in. Soooo, you will have to be the judge….I’m sure it did not work out that way for everyone. One note: Shaving your pom too short can actually prevent them from being able to cool themselves….I know it does not sound logical, but the hair on your pomeranian actually helps them to cool and prevents too much sun on their delicate skin.